The Middle Power Project describes a defining period of Canadian and international history. During the Second World War, Canada transformed itself from British dominion to self-proclaimed middle power. It became an active, enthusiastic, and idealistic participant in the creation of one of the longest lasting global institutions of recent times — the United Nations. This was, in many historians’ opinions, the beginning of a golden age in Canadian diplomacy. Chapnick suggests that the golden age may not have been so lustrous. During the UN negotiations, Canadian policymakers were more cautious than idealistic. The civil service was inexperienced and often internally divided. Canada’s significant contributions were generally limited to the much neglected economic and social fields. Nevertheless, creating the UN changed what it meant to be Canadian. Rightly or wrongly, from the establishment of the UN onwards, Canadians would see themselves as leading internationalists. 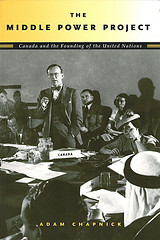 Based on materials not previously available to Canadian scholars, The Middle Power Project presents a critical reassessment of the traditional and widely accepted account of Canada’s role and interests in the formation of the United Nations. It will be be read carefully by historians and political scientists, and will be appreciated by general readers with an interest in Canadian and international history.